As might be expected for something released so close to its forerunner - especially a forerunner that had nothing fundamentally wrong with it - there have been few significant changes between the RM-VL710 and RM-VL600. First and most important is that the new model supports 8 devices instead of 5. This brings the RM-VL600's total capabilities up to not just the RM-VL900's level, but a little beyond: the RM-VL600 also manages to squeeze in one extra macro and four additional hard buttons (representing 32 more commands). The second and most obvious change is with the design: nothing looks similar, and yet everything generally remains the same. Confused? Let's detail what's new. The RM-VL600 measures 2.19" (5.6cm) wide at the bottom, tapering ever-so-slightly to 2.07" (5.3cm) in width at the top. Its length is 8.63" (22.0cm), the longest from the company so far. 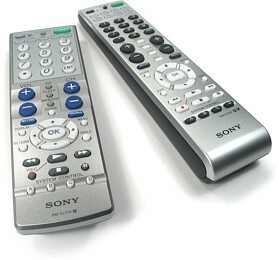 The remote is slender, measuring 1.09" thick at the bottom (2.7cm) and slimming down to 0.76" at the top (1.5cm). The RM-VL600's weight, at 5.7 ounces (161 grams) with batteries or 4.0 ounces (111 grams) without, is only a few grams heavier than the RM-VL710. The balance point is directly under the [Cursor Up] key. A small dark plastic window on the front of the remote conceals dual IR emitters, while a large compartment on the back holds two AA batteries. It's nice to see Sony sticking with standard AA batteries for their remotes, since they last so much longer than AAA versions. The compartment lid allows only a tiny amount of movement when closed and doesn't require undue force to open. Also on the back of the remote, just above the battery lid, is a small horizontal finger groove placed directly behind the [Volume +] and [Channel +] keys. Although the groove is in a comfortable spot, it's not as pronounced as the one on the RM-VL700 and serves little ergonomic purpose. The top half of the case is finished in metallic silver paint, with regular black plastic on the bottom. All keys are made of soft rubber, with the majority being either black rubber with white printing or white rubber with black printing. The whole look is pleasingly monochrome, enhanced by a lone bright green button and small red label. While the RM-VL600 features the same basic keypad layout as the RM-VL710, nearly every button has been resized, tweaked in placement, or reordered. The RM-VL600's new layout is appreciatively improved over the RM-VL710, with a more uniform distribution of keys that all but eliminates the bizarre combination of crowding and over-spaciousness seen on the original. The numeric keypad is a more reasonable size, the menu cursor controls have been enlarged, and the spacing between problem areas (such as the keypad and [Volume]/[Channel] toggles, or [Muting]/[Recall] and the menu cursor controls) is now more reasonable and won't result in accidental key presses. Another good design change is the reduction of tiny round buttons. The RM-VL710 had 15 of the non-finger-friendly fellows, while the RM-VL600 is graced by only 5. 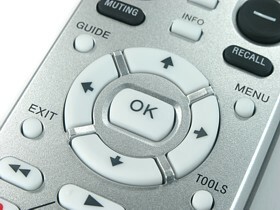 One oversight in the RM-VL600's layout is the lack of DVR-related functions such as dedicated chapter skip and page up/down keys, although many such devices will function without their inclusion.